[AUTO](VC):When placed, three of your front row units get [Power]+10000 until end of turn. 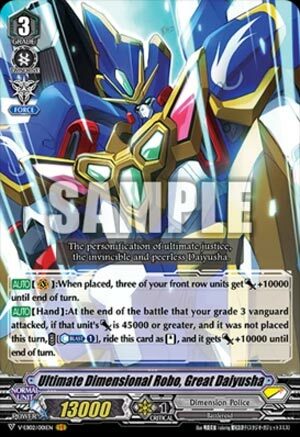 [AUTO](Hand):At the end of the battle that your grade 3 vanguard attacked, if that unit’s [Power] is 45000 or greater, and it was not placed this turn, COST [Counter Blast (1)], ride this card as [Stand], and it gets [Power]+10000 until end of turn. Finally, we can actually start on the new Extra Booster (and here I was thinking we needed to fill a week reviewing things like Dragonic Gaias). Anyway, Great Daiyusha here is your entire win-con of the Dimension Police deck. 45k requirements for power is steep to be sure: even with a Force Gift on the Vanguard, Daiyusha would need a total of 3 uses of base Daiyusha, Daidragon, Daibrave and/or Cosmo Beak between them EACH to kiss the power without triggers, otherwise you’re looking at resting a lot of units with Daiyusha and losing pressure, or calling over the rested cards and undermining the cost, although considering Great Daiyusha is a net +1 to you, minusing yourself can sort of be tolerated. That was sort of the whole point of the huge requirements I suppose. Not saying it’s realistically unlikely though, as the latest he goes off is Turn 4 and by then you should have sped through enough deck to not only have the rear-guards to proc it, but also draw into a copy of Great Daiyusha. Woe betide you if you ride this first though, because you’d have to use Commander Laurel just to make numbers. Because of that it loses points, but it’s still dumb NOT to run at 4.